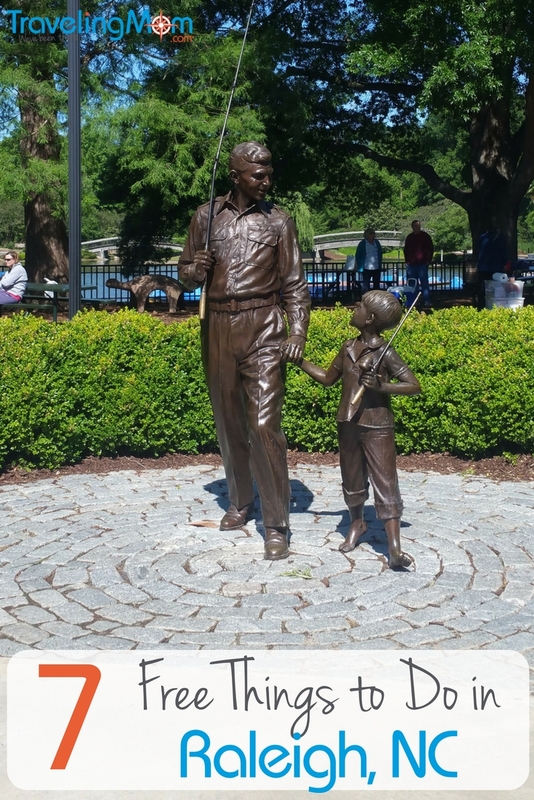 Long Weekend Traveling Mom was amazed by the number of free things to do in Raleigh, NC. From arts to history and science, she thinks it’s worth a visit longer than a weekend. 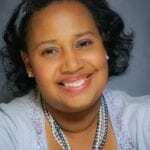 Check out what her favorites were when she took a trip with her tween son. Raleigh, North Carolina isn’t on the top of most cities for families to visit and I think that’s a huge mistake for several reasons. Top of the list is that it’s easy to get to and an affordable place to visit. Part of what makes it so affordable is the large number of high-quality, fun and FREE things to do Raleigh. And Raleigh isn’t just FREE and fun for families but couples and girlfriends as well. 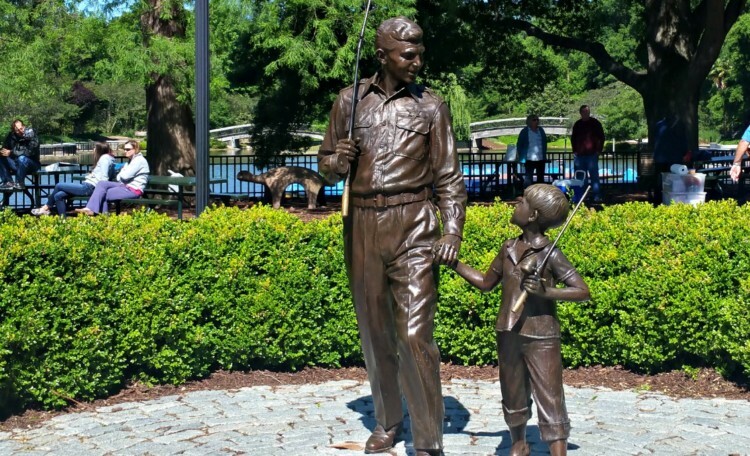 Check out my list of my favorite free things to do in Raleigh. The North Carolina Museum of Art (NCMA) has a unique history. It was established in 1947 when the North Carolina legislature became the first US state of use public funds to buy art. NCMA has evolved a great deal since its beginning but still maintains a commitment to making art accessible to everyone. The current location is a large park with two buildings that house special exhibitions and their permanent collections. My 8-year-old son and I took full advantage of the 164-acre Museum Park outside by checking out one of the Explore on Your Own Park Packs. The Park Pack contained all printed materials and guides we needed to learn about the installations on the grounds as well as materials for my son to make his own interpretations of the works. 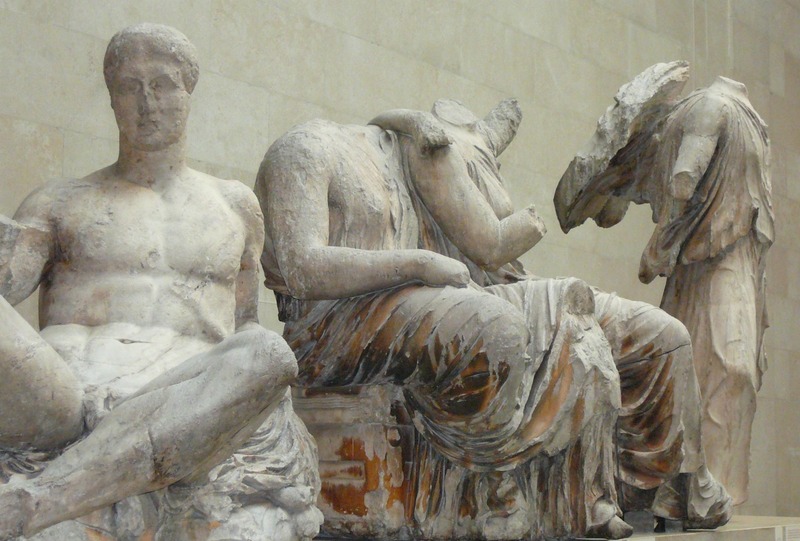 TravelingMom Tip: Check the website in advance of your visit. There are weekend family tours, pop-up workshops and family festivals year round with different themes. Almost all are free, but some special events like concerts and movies have a small fee for non-members. The Museum of History is a goldmine of historical content for families. The Story of North Carolina is the permanent exhibits and traces North Carolina from its earliest beginnings to the present. I see it as a goldmine because it starts with the native inhabitants and then goes into a great deal about North Carolina as a colony (one of the original 13!). This year my son studied early American history and I realized how much more interesting history is an adult. The Story of North Carolina doesn’t wait until children grow up though. There are tidbits like why North Carolina was a haven for pirates and plenty other insights that children from any state can use for history trivia in school. 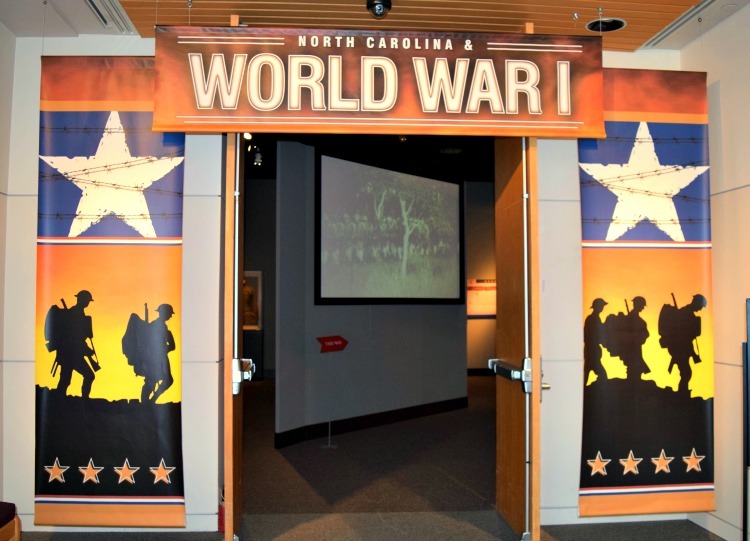 The current exhibit, North Carolina and World War I, will be open through January 2019 and focuses on North Carolina’s role in WWI on the front in France and Belgium. The exhibit has more than 500 artifacts and a trench diorama. There is even historical film footage to provide a comprehensive understanding of what life was like for the soldiers. It is an amazing look at World War I for families of all ages. I would make a visit back to just experience this exhibition. Along with the Museum of History, the North Carolina Museum of Natural Sciences asks visitors to learn more about the natural sciences. There are seven floors over two buildings and wings. The Nature Exploration Center features the diversity of habitats in North Carolina. From the Appalachian Mountains to the Atlantic Ocean and prehistoric beasts to amazing arthropods, they cover it all. There is even a living conservatory of a Central American tropical dry forest filled with living plants and animals. From the Appalachian Mountains to the Atlantic Ocean and prehistoric beasts to amazing arthropods, they cover it all. There is even a living conservatory of a Central American tropical dry forest filled with living plants and animals. The Nature Research explores how we understand the natural world with tools, techniques and working science labs. Families can even become their own scientist in the Naturalist Center by looking at specimens individually on two interactive computer field guides. 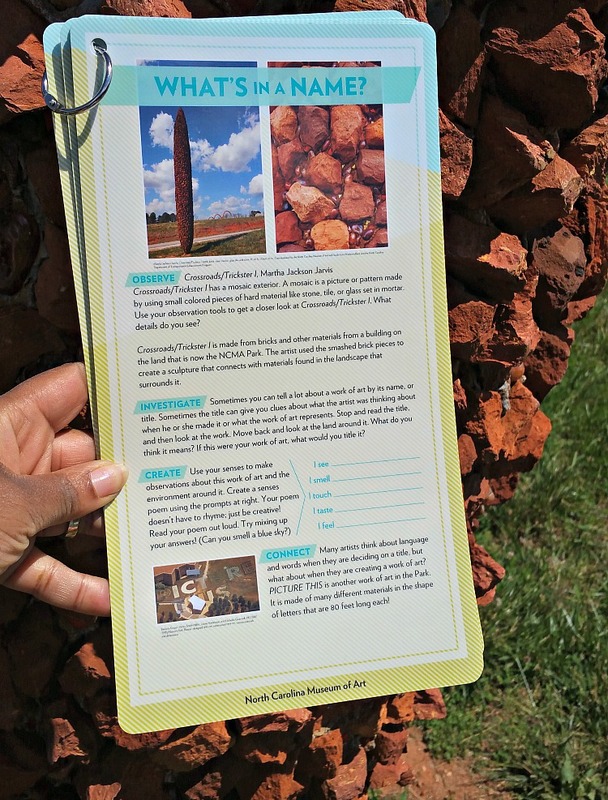 TravelingMom Tip: Although the North Carolina Museum of History and Museum of Natural History are literally across a plaza from one another, don’t make the mistake of trying doing both in one day. There is enough to explore in each that they can have a full day. If you can’t make a two-day visit, make sure to do research in advance and pick out your favorites at each. Pullen Park is the first public park in North Carolina and one of the oldest operating amusement parks in the United States. Located next to North Carolina State University on 66 acres of land, enjoy several areas for picnicking, playing sports and even an indoor Theater in the Park. 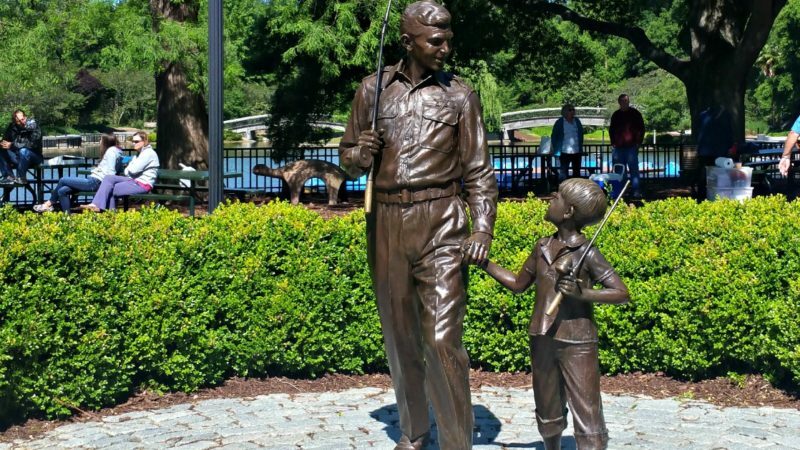 One of the favorite attractions is the statue of Andy and Opie from the classic “Andy Griffin Show.” The park is home to an amusement area perfect for families. The amusements hearken back to the golden age of the park with tickets for $1 each ride, including kiddie boats, pedal boats, a one-third size C.P. Huntington miniature train, and Gustave A Dentzel carousel. The carousel is listed on the National Register of Historic Places. It was originally installed in 1911 and fully restored to its original condition. 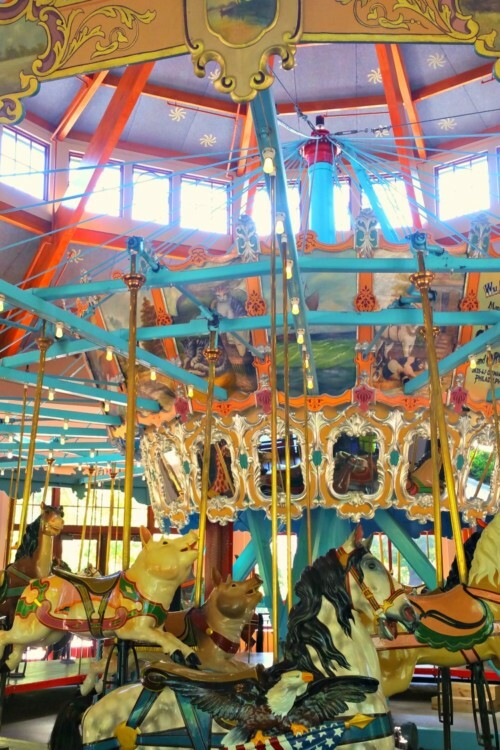 TravelingMom Tip: Do you know the difference between a carousel and merry-go-round? Opinions vary. One of the differences is the merry-go-round is a ride with all horses versus carousel has all different types of animals. 5. 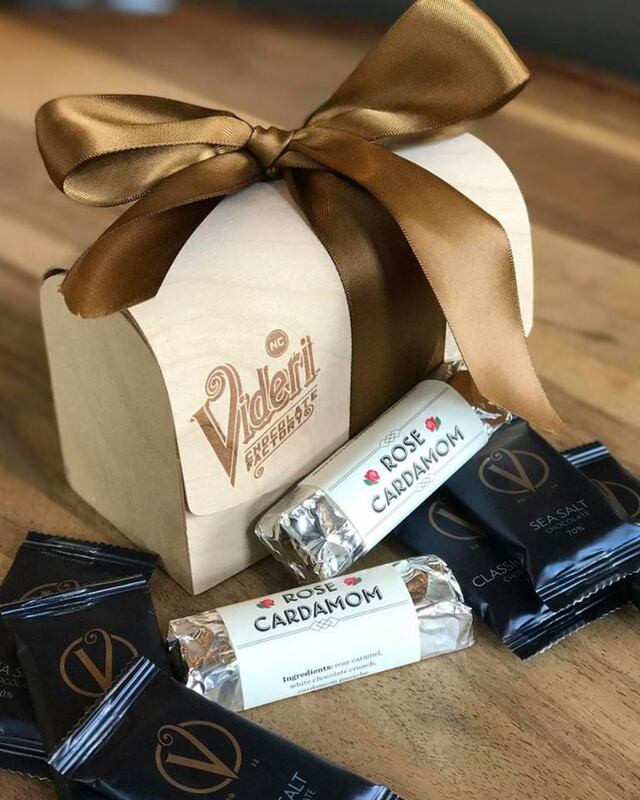 Visit the Videri Chocolate Factory. Take a self-guided tour at the Videri Chocolate Factory before getting a free sample. Signs posted at each window takes visitors through the process of how chocolate is made in small batches. Discover thought-provoking exhibits and events at Artspace where guests of all ages can engage with artists. It focuses on opportunities for curious visitors to connect in unique ways like iPhone portraits classes. 7. Experience the charm of Raleigh in the historic City Market. The cobblestone streets of the historic City Market are home to art galleries, restaurants and shopping areas that remind visitors of its history as a farmers market. If you visit in the morning, grab breakfast at Big Ed’s. Just a tip: Only order one pancake – it’ll be plenty for most people. Love this story—-maybe because I have enjoyed Raleigh twice but did not do everything you suggest. Hurray for reasons to return!